Frequently Asked Service Questions . . .
What is the warranty on a new, Norweco © model 206C aerator and control panel? How often should Norweco Mechanical Tanks be pumped out? I have an alarm going off in my basement, what do I do? What can or can’t (chemicals, home products, etc.) I use in connection with my Norweco septic system? Why do I need a Maintenance contract and how do they work? Do I have a cavatette system? or What system do I have? What damage is done if I don’t have a maintenance contract for a couple years? How do I request a Service call? What kind of access do I need to leave for the service visit? I received notice that I failed a health department effluent test. What do I do? If I do not have a contract, can I still schedule a one-time service visit? What Maintenance Contract should I choose? How often should Norweco Mechanical Tanks be pumped out?Periodically it is necessary to have the Norweco Mechanical Tank pumped out by a licensed septic pumper. This time frame varies according to occupancy and usage of the system. Our suggested standard is between 2-5 years. Our technicians will advise the customer if they feel it is necessary to have the tank pumped out because of the buildup of solids, sludge, and/or non-biodegradable material in the tank. Our 500 gallons per day tank has a total liquid capacity of 1300 gallons. This is pumped from the pretreatment compartment which may or may not be buried. If it is buried, it can be found up-stream from the aerator chamber in line with the inlet and approx. 12” below ground. The aeration chamber must also be pumped out and this is the chamber that contains your aerator. The aerator must be removed before pumping begins to prevent damage. The two alarms Norwalk would be concerned with are the Norweco Control Box alarm and the Septronics High Water Alarm. All Norweco Mechanical Tanks will have a control panel but not all customers will have a high water alarm. The control panel will have a reset button on the front of the box and can be pushed to reset alarm. If that will not reset alarm (and stay off), a service visit needs to be scheduled to troubleshoot the cause for the alarm. If the High Water alarm is sounding, there may be a high water situation in the lift station. The customer should press the button marked, “Silence Horn” and a service visit should be scheduled. Heavy amounts of rain can cause your system to become saturated, slowing down the natural flow of your septic discharge. After heavy rain, the water in your mechanical tank may not leave quickly enough and this cause the alarm to sound. The best thing to do is to turn off your system at the control panel and let the ground take up the slack from the rain. After 1-2 days, turn your system back on and try to get the control panel to reset. If you still can not reset the system, then you should call Norwalk to have your system examined for other possible problems. There are some chemicals, products, and substances, used in the normal household that can not be flushed down the drain of a household using a mechanical septic tank. Many of these substances have a detrimental effect on the organisms and the bio-kinetic process taking place in the tank and could do damage to the tank itself. Please see the “Dos and Don’ts" sheet available on the download page of the Norwalk website.. Many people call in and ask about their cavatette system. People will use the name cavatette as a generic term to describe all mechanical aeration systems. “Cavatette” is actually a very old brand name (no longer being produced). If you have a concrete cover that looks like a rectangle you may have an old Cavatette system. All Norweco systems can be distinguished by the round cover or covers on the openings of the tank chambers. Norweco tanks will have 1, 2, or 3 concrete covers, one of which will have a black vent cap molded directly into the cover. This cover should be on the chamber where the aerator is installed. If you have only one cover and it is vented, you have a Norweco 780 series tank. If you have one vented cover and one non-vented cover you have a 960 series tank installed before 1996 (the non-vented cover is over your bio-kinetic filter). If you have a non-vented cover up-stream(closer to house) from the aerator and a non-vented lid downstream(further from your house) from your aerator, the up-stream lid is covering your pre-treatment chamber. Diagrams and specifications of our Norweco brand tanks can be found on the Home Sewage System of our website. First and foremost it is ILLEGAL in the state of Illinois not to have a maintenance contract on a mechanical aeration system. Second, by discharging raw sewage into our environment, you may be doing irreparable damage to your property, the property of your neighbor, and the local water table servicing your community. Finally by not maintaining your system properly, you can damage one or many components of your system. This damage can range from hundreds of dollars in repair to an aerator, to tens of thousands of dollars in damage to your tank, sand filter, and/or your septic field. A $200 yearly investment could save you a $20,000 cost in the future. If you are requesting your normal regular service visit, without any specific time needed, you can email your request to Service@NorwalkTank.com . If you have an alarm going off or you need a specific time and date, please call the Norwalk office at 815-726-3351 and ask for the Service Department. Specific time requests should be limited to 1st (8:00-8:30) appointment in the morning, AM only (8:00-12:00) appointment, or PM only (12:00-2:30) appointment. First, the service technicians needs free and open access to your system. This would include unlocking all gates and fences. Please keep family pets away from the system while it is being serviced. Also, please remove all planters, bird baths, and fountains off of the system covers before service. Second, landscaping needs to be planned in such a way as to have walk up access to the system. The components of your system that must be moved or replaced are very heavy and cumbersome, so landscaping around the tank needs to leave at least a 4 foot opening to your system. It becomes a safety hazard for our technicians if they have to lift system components up and over landscape materials. Also, please keep mulch and rock at least 6” below the top level of the covers. This material can fall into the system when lids are off and cause damage to system components subsequently causes expensive repairs. When you receive notice of a test failure, please contact Norwalk Tank and schedule a service visit. After that service, the health department will revisit your property and test your system again. Please note that Norwalk Tank can not request the health department to come out and retest. 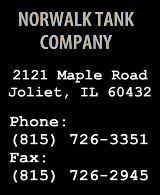 You may, at any time call and schedule a one-time service visit with Norwalk Tank service department. Please contact us for specific pricing that applies to these one-time services. The customer will be charged for the service visit, filter change, and any chlorine that is added to the system. The best value for our customers is to sign up for a yearly maintenance contract, with service visits, filter changes, and chlorine built right into the contract as well as other valuable services. You need to choose the contract best suited for the needs of your system. If you system needs to have chlorine added to it, you need to chose between a Group 2, 3, or 4. You may not choose group 1. If your system is an older system then it might be wise to choose a group with more emergency visits included in it. Also, if you have a large demand on your system (i.e., people in household, lots of laundry) you may want to upgrade to an upper group. © copyright 2010-2019 Norwalk Tank Company. All Rights Reserved.